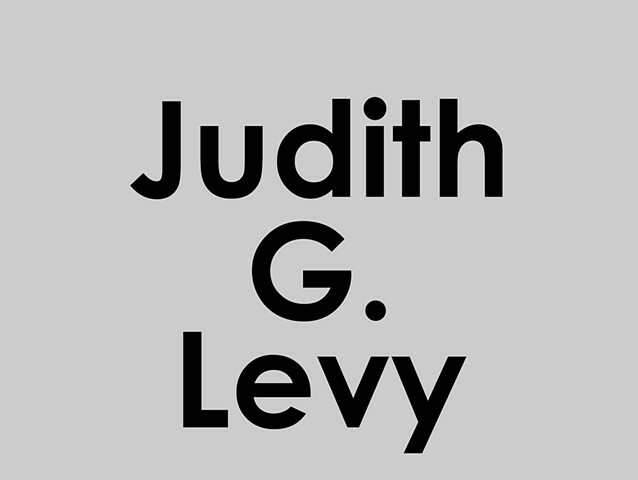 Human nature is Judith Levy’s muse. As an artist, she has found endless inspiration in the lies we tell ourselves and others, the histories we invent, the facades we hide behind, and the feelings we disguise. Next weekend, Levy will unveil a new 50-minute film. “NV in KC,” is a poignant and hilarious send-up of a fictional conceptual art project that involves ranking Kansas City artists and institutions. “This is a story about a woman who has a conceptual art project that isn’t very good,” Levy said during a recent studio visit. Funded by an Andy Warhol Foundation Rocket grant and featuring a talented cast of local actors and artists — including Levy herself playing the lead character, artist Lee J. Ross — “NV in KC” is provocative on a number of levels. The film opens in Lee J.’s studio, where a large chart ranking the city’s visual artists in order of importance (the names are fictionalized), hangs on the wall. The preposterous chart immediately provokes a scene of high drama when Ross’ best friend, Tanisha, played by artist and photographer Jaimie Warren, sees her name ranked lower than she thinks she deserves. A fight, with harsh words and some pushing and shoving, ensues. “You’re not making art, you’re making enemies,” cries Tanisha, before stomping out. behavior — “I waited calmly” — she reveals that she has started to receive disturbing text messages from her angry friend. The film proceeds in a series of vignettes, moving from Ross’ studio to therapy appointments to visits with artist friends. “What makes you think you’re in a position to make these judgments?” demands her actress friend Molly, played by actress and musician Erin McGrane. “I don’t think this is your best project,” counsels an artist named Jack, played by artist Garry Noland. exploration of envy, “a feeling,” she says “that most artists experience and suffer with silently.” Humor and pathos are the glues that hold it all together. And like “the Last Descendants,” “NV in KC” showcases Levy’s impressive flair for dialogue, narrative and directing. Interviews with local arts professionals are interspersed with scenes of Lee J. at home being babied by her partner, Susan (played by Carol Holstead), and quarreling with her artist friends. The professionals play themselves, but their words have been scripted by Levy. Part of Lee J.’s conceptual art project involves ranking local arts institutions, an effort she shares in an interview with Nelson-Atkins Museum of Art director/CEO Julian Zugazagoitia. It is his task to explain to her why she should reconsider ranking the Kemper Museum of Contemporary Art on the same level with the behemoth Nelson. “I think there’s some tweaking (to be done) here,” he tells Lee J. with pleasant restraint. Interviews with gallery owner Sherry Leedy, Block Artspace director Raechell Smith, art consultant Rachael Blackburn Cozad and Spencer Museum director Saralyn Reece Hardy revolve around questions like “How can an artist deal with the complexity of the art world?” and “Do you think there are art trends?” Their good faith contrasts with our suspicions of Lee J.: Are the interviews really just a ploy for access? At some point each of the professionals shares the truism, “envy eats its own heart.” They go on to recount personal experiences of envy and ways to make the feeling productive. And the group has lots of sage advice for envious artists, ranging from “focus inward” to “find the place where you fit in.” The tact and coolness of the professionals contrasts with the aching vulnerability of the artists portrayed. The drama reaches a crescendo when Lee J. sets out to repair her relationship with Tanisha and makes a surprise discovery about the sender of the nasty texts. The barrage of criticism, sinister texts and shattered friendships all force Lee J. to re-evaluate her approach. The film ends with her retooled concept for the project, enacted by Shannon Michalski. She plays a ceramics artist excluded from the initial chart. That’s a tall order, and one “NV in KC” — is unlikely to fill. What it does deliver is a highly entertaining exploration of human foibles and artistic truths — in the distinctive Levy style. “On the Seventh Day”, a short film by Judith G. Levy, plays in the main gallery. In the film, we see Levy in front of a mirror, staring at us, as we watch her put on her make-up. Each day she puts on different products and each day she listens to different things: music, talk radio, the old Hitchcock film “Notorious”. The title suggests the biblical story of Genesis and God’s six day creation of the world. In that story, God finishes Creation on the sixth day by creating Woman. In the sixth day of Levy’s film, we see her putting on lipstick, the final act in most make-up routines. On the final seventh day, God’s day of rest, a fatigued Levy take’s her eye liner pencil and draws large, Elvis-like sideburns onto her face. It’s a whimsical notion of how God might have spent that day (pretending to be Elvis), but also a powerful statement against gender normativity: no matter how we were born (whether in the image of a God or not) and no matter what society says we should look like, we are free recreate ourselves in any image we choose. Dana Self reviewed my exhibition for The Kansas City Star. I was commissioned to create an interactive installation, Memory Cloud, for an exhibition, Memory Theater, a Memorial Art Gallery, a museum in Rochester, NY. My web host, OtherPeoplesPixals, recently selected me as one of their featured artists. Thank you OPP. The Lawrence Journal World featured me in an article about Lawrence residents who were awarded Andy Warhol Foundation Rocket Grants. Here is the press release for The Last Descendants, a video and installation exhibition at the Paragraph Gallery on view from Sept. 16th to Nov. 5th. This installation was created for the City Center Square post office window in downtown Kansas City. Here is a link to a review of Panoramic Postcards by Lauren Wells, Kansas City Star, November 6, 2010. Here is the press release from The Charlotte Street Foundation, Kansas City, who commissioned Panoramic Postcards. The Indianapolis Museum of Art interviews feature artists that show at the museum. This interview can be viewed on artbabble, their video site. In the video there are images of Memory Cloud, the installation that I was commissioned to create for the IMA, and hear me briefly discuss my work. Here is the press release for my upcoming installation that was commissioned by the Indianapolis Museum of Art. Lou Harris picked Memory Cloud as one of his top ten favorite art/cultural events of 2009. Judith Levy's piece, Memory Cloud, now hangs in the IMA's Efroymson Family Entrance Pavilion through January. It features hundreds of plastic viewers containing slides, representing memories from the 50s, 60s and 70s. Art critic, Lori Waxman, came to Kansas City in April to perform her art critic piece. I was fortunate enough to participate in her project. Please read her critique of my work!